Securing a space for your business can be a daunting task, especially in a competitive market. From finding a convenient location for employees, ensuring the space is large enough to accommodate your team, and making sure the price is affordable, there is much to consider before purchasing or leasing commercial real estate. Navigating the tricky commercial real estate purchasing process is not easy, and it doesn’t help that real estate comes with its own unique vocabulary. If you’ve found yourself scratching your head at terms like CAP rate, common area maintenance, and sublease clause, it’s time to do a bit of research before you start looking. Learning the following must-know commercial real estate terms will save you confusion and possibly even money when purchasing or leasing a space for your business. Listings. ‘Listings’ will likely be one of the first commercial real estate terms you encounter as you begin looking for a space for your business. Simply put, the term ‘listings’ refers to the list of available commercial real estate properties. You can find commercial real estate listings in various formats, include through both print and online sources. The listing for a commercial real estate property will include important information you’ll need to determine if a space has the features you need and want, including price, square footage, number of private offices, and more. Building Classifications. As you’ll find out during your search for a commercial real estate space, not all buildings are created equal. Fortunately, there is a system in place to help you determine the quality of a potential office space. Building classifications are used to rank an office building, and there are three classes into which commercial spaces fall - A, B, and C. A Class A building is one that is new, in great condition, possesses high quality amenities, and is located in a prime location. As you might have guessed, Class A office buildings come with a higher price tag. Class B office buildings will have less amenities, and will usually have fewer floors than Class A commercial properties. When a Class A building has experienced normal wear and tear over the years, they will typically be downgraded to Class B. Finally, Class C office buildings are older properties in need of repairs. While Class C rents will be lower, these office buildings are found in less desirable areas. Tenant Representative vs. Landlord Representative. Unlike the sale and purchase of a lower value consumer product, there are typically additional individuals involved in the commercial real estate purchasing or leasing process. Supporting both the prospective tenant and landlord through the process are the tenant representative and the landlord representative. The tenant representative is a commercial real estate agent that represents the tenant, providing services including finding potential office spaces that fit the tenant’s needs, setting up showings of spaces, negotiating on behalf of the tenant with the landlord, and can even serve as an intermediary should any disputes arise with the landlord. The Landlord representative on the other hand represents the landlord. Their job is to ensure the landlord receives the appropriate amount of rent for the least amount of expenses, and can negotiate with the tenant on behalf of the landlord. Rentable Square Footage. When searching for a commercial real estate space for your business, you will likely encounter buildings in which multiple businesses operate. Rentable square footage, or RSF, is a term used to describe the total usable square footage of a building including the shared spaces that other businesses will use as well. Shared spaces that fall into this category include areas like storage spaces, hallways, restrooms, and shared lobbies. Though these spaces are shared, they will be factored into the rent you pay. Useable Square Footage. The usable square footage, or USF, is the square footage your business will occupy within a commercial rental property. This term excludes shared spaces like stairways, restrooms, lobbies, storage spaces, and hallways. In some cases, such as those where an entire floor is leased to a single business, spaces like restrooms and storage rooms will be included in the USF because it is exclusive to your company. To calculate the USF of a commercial real estate property, simply subtract any shared square footage from the total floor area. Common Area Maintenance. 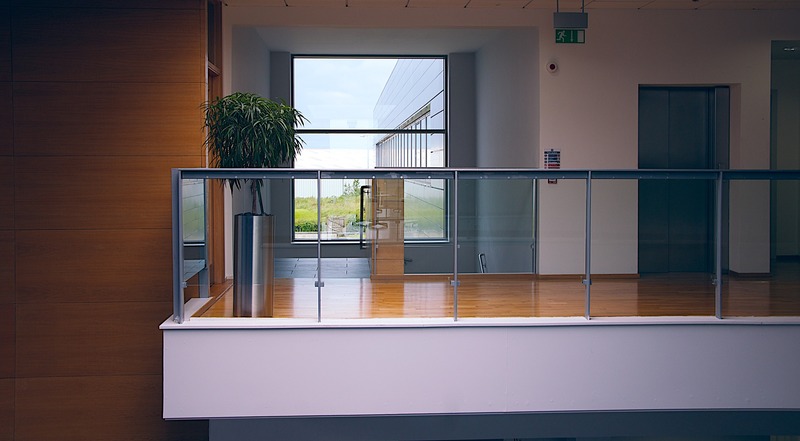 Often referred to as simply CAM, the term common area maintenance is a term used to describe the amount of expenses your business is responsible for paying in order to maintain the building, in addition to rent. When you are leasing an office space, you may simply assume that maintenance costs for the building sit solely with the property owner. However, this is not always the case. Each landlord has their own method for calculating CAM, so it is important to ask them early in the process how they calculate this amount for the space you’re interested in. Common CAM fees include costs such as landscaping fees, cleaning services, repairs, security costs, and utilities. Sublease Clause. If you are interested in leasing an entire floor for your business, you might be wondering what your options are in terms of leasing out part of the space to another business or individual for additional revenue for your business for only a partial amount of time of the duration of your lease. In this case, it is important to know if your rental agreement includes a sublease clause. This clause states whether you have the right to sublease your office space at any point. You will need your landlord’s consent, so it is important to discuss the potential of a sublease early on in the process to ensure it is stipulated in your lease. In some cases, a landlord might allow you to sublease your space, but also stipulate that they must approve of the additional tenant. In this instance, they will likely review the potential tenant’s finances, credit history, and their willingness to adhere to the original terms of the lease. At Corporate Suites, we understand that finding the commercial real estate space that meets the specific needs of your business is not an easy process. For this reason, we’ve developed top quality, fully-furnished NYC office spaces for businesses of all sizes to help maximize performance and growth. Work, network, and collaborate in one of our inspiring office environments that can be customized for your business. Our representatives are standing by to help match you with the perfect space for your team.